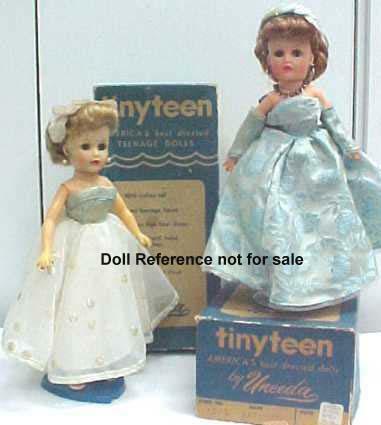 Uneeda Tiny Teen Suzette Doll 1957-1960s - Little Miss Revlon competitors, have rigid vinyl bodies with softer vinyl heads and rooted hair, sleep eyes, most came with pierced ears with pearl earrings, doll is jointed at neck, arms, some have a twist waist, jointed hips with high heel feet. Dolls came in various hair colors & styles as you can see from JoAnn's collection, they had as many outfits to choose from as Barbie & Ken. All outfits shown are original Suzette, except the 2nd from right in black with hot pink trim is a (OOAK) one of a kind outfit. 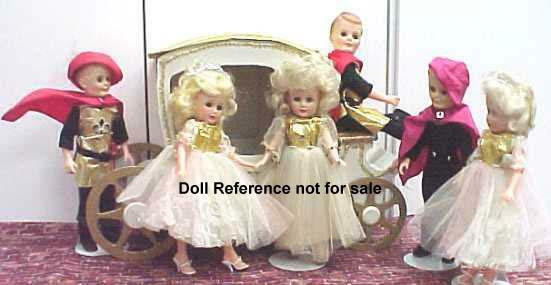 Uneeda Tiny Teen Suzette doll is marked Uneeda, U or unmarked. 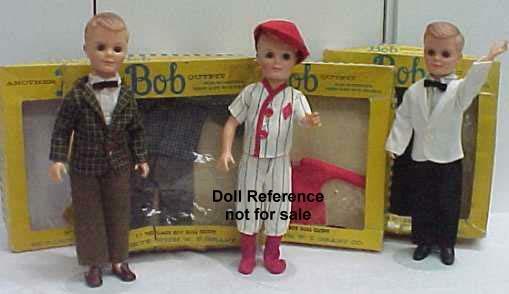 Uneeda Tiny Teen Suzette's in original dress's in turquoise with pointed collar and ribbon tie and the same style in pink polka dots, and more NRFB outfits behind them, showing the original packaging. gown with arm pieces and hat with original boxes. These two ladies have the twist waist and have necks. 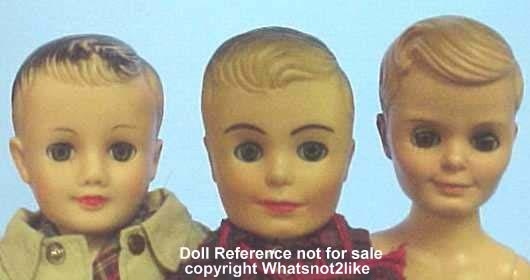 These Suzette's are referred to as "no neck" as the heads seem to sit right on the body, you can see the difference between these and the dolls pictured just above, that have a neck. Blonde short hair in original blue gown, Brunette short hair redressed in a cowgirl outfit and Platinum long hair redressed in a pink gown. 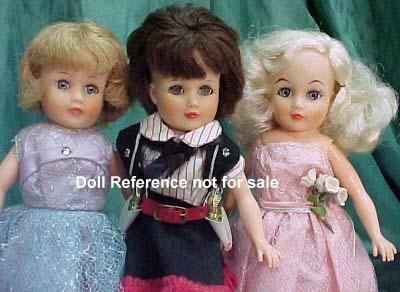 These three ladies also do not have the twist waist, and are from about 1959. 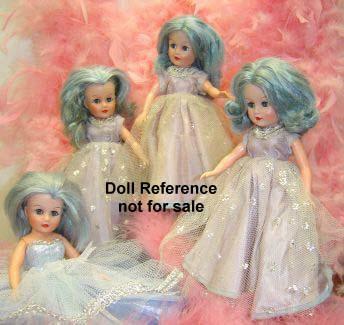 1962 Uneeda Tiny Teen Suzette doll Blue Fairy by Disney - have blue rooted hair and fancy gowns, each doll came with a heavy silver cardboard crown and a wand. 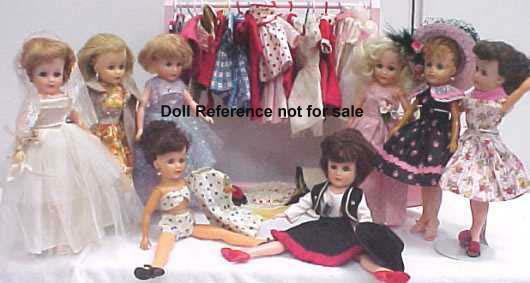 All of these dolls do not have twist waists, doll in the gown on lower left is whatsnot2like's OOAK - very nice. 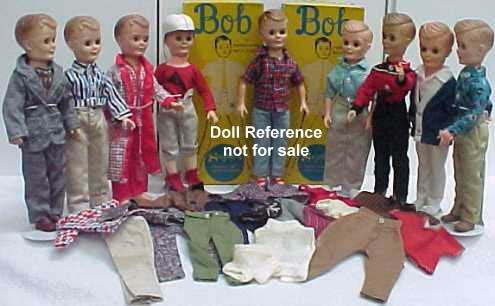 Uneeda's Tiny Teen Bob doll is 11" tall, is Suzette's boyfriend, he's unmarked or marked U, Uneeda and as you can see, has an extensive clothing line, he was as much a clothes horse as his girlfriend Suzette. Uneeda Tiny Teen Bob in a plaid sport coat, white shirt with bowtie, next wearing a baseball uniform, then Senior Prom a formal white tuxedo suit. What a spiffy guy.